Global Electronic Trading: Activity Based Costing: Easy as 1..2..3? Activity Based Costing: Easy as 1..2..3? This spurred some pretty heated debate with many participants confessing that their own firms have understanding of total costs generated by the firm but little understanding of how to apportion these costs to a specific activity. So they know the total revenue and total costs of the entire firm but cannot apportion costs and revenues to specific activities with any degree of granularity. I raised the notion of "Activity Based Costing" which is described in some detail on the wiki page linked. a buy-side client uses Portware as an EMS. What does it cost to carry out the first trade on that environment? And then subsequent trades? And what's the average at a specific volume of order flow? 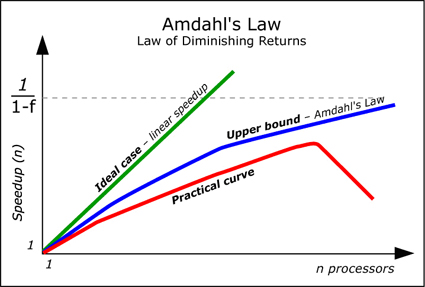 Part of my thoughts on this were around the relevance of Amdahl's Law to this, in the specific sense that the exact answer may be almost impossible to calculate to a 100% degree of certainty but it can be clear that there are certain areas where optimisation is possible. As such, spend some time on working out costs apportioned to the finest degree of granularity ("bottom-up analysis") but also start looking at the big ticket costs ("top-down analysis"). As banks have cut headcount repeatedly over the last few years their cost bases have not always been kept in synchronicity with their revenue base. So some clients get platinum grade service for a lower tier of flow and for a lower tier of profitability. And as EMS platforms have competed and positioned themselves in the market are clients getting the right technology from the sell-side from the perspective of sell-side profitability.